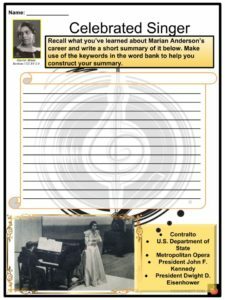 Marian Anderson was the most highly celebrated African American opera singer of her time. She performed in grand venues with well-known orchestras in the United States and Europe. 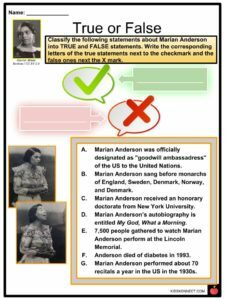 See the fact file below for more information on the Marian Anderson or alternatively, you can download our 22-page Marian Anderson worksheet pack to utilise within the classroom or home environment. 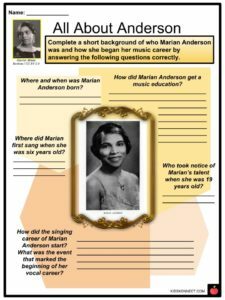 Marian Anderson was born on February 27, 1897 in Philadelphia, Pennsylvania. At a young age, she already showed talent in singing, but her family could not afford to get her a formal music education. 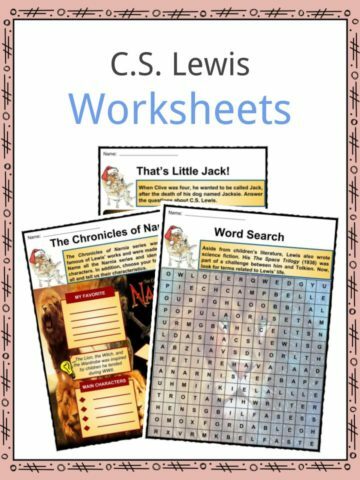 When she was six years old, she began to get training in the choir of the Union Baptist Church. Church members helped Anderson raise funds so she could attend lessons from a famous vocal teacher and attend South Philadelphia High School. She applied to Philadelphia Music Academy but was denied admission because of her race. At 19 years old, she was given free vocal training by Giuseppe Boghetti because he was impressed by her musical prowess. Under Boghetti’s mentorship, Anderson entered into a New York Philharmonic voice competition. She won first prize and was signed by a manager which launched her singing career. She has a contralto voice and was known as one of the finest contraltos of the twentieth century. She experienced racial discrimination in the US but not in Europe. In 1930, Anderson’s first European performance was held in Berlin. 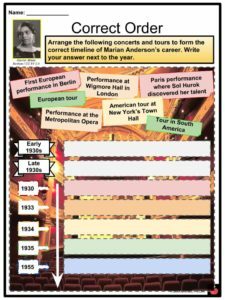 In 1933, she performed at Wigmore Hall in London. She successfully toured Europe in the early 1930s. She sang before monarchs of England, Sweden, Denmark, Norway, and Denmark. She also performed in France and Belgium. Upon hearing her perform in Paris, American impresario Sol Hurok became her manager until the end of her career and he convinced her to return to the US to perform. She opened her American tour at New York’s Town Hall in December 1935 and it was a huge success. She toured in South America and Europe shortly thereafter. On January 7, 1955, she was the first African American singer to perform at the Metropolitan Opera in New York. In 1957, she performed for President Dwight D. Eisenhower’s inauguration. In the same year, the US Department State and the American National Theatre and Academy sponsored Anderson’s tour in Asia which included 24 concerts in 14 countries. In 1958, she was officially designated as “goodwill ambassadress” of the US to the United Nations. In 1961, she performed at the inauguration ceremony of President John F. Kennedy. In 1963, she sang at the March on Washington for Jobs and Freedom which was an important event during the Civil Rights Movement. Her international farewell tour began at Constitution Hall on October 24, 1964, and ended at Carnegie Hall on April 18, 1965. Despite her popularity in the US – performing around 70 recitals a year in the 1930s – she still faced racial discrimination. She had experiences where she was denied entry to hotels and restaurants. In 1939, she tried renting the Constitution Hall in Washington D.C. for one of her concerts but was denied access by the Daughters of the American Revolution because she was black. This incident caused outrage and protest from her supporters including Eleanor Roosevelt. 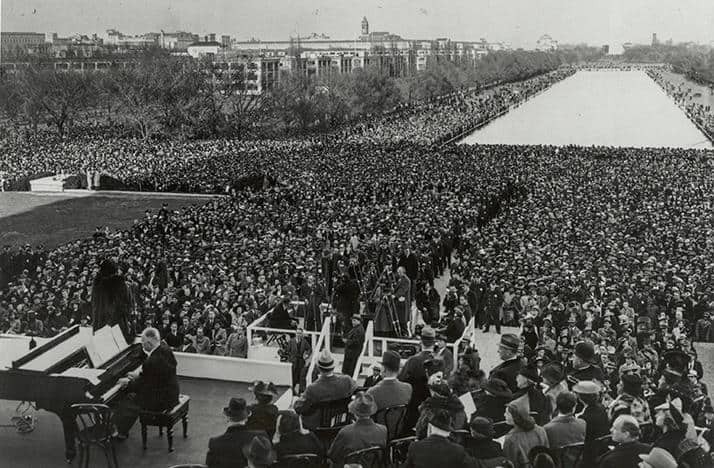 She appeared at the Lincoln Memorial instead where 75,000 people gathered to watch her perform. In 1943, she was invited by the Daughters of the American Revolution to sing at the Constitution Hall as part of a benefit for the American Red Cross. In 1943, Anderson married Orpheus Fisher with whom she bought land in Danbury, Connecticut. Their residence was called Marianna Farm. Her husband died in 1986 and she lived on their farm until 1992. In 1957, her autobiography entitled My Lord, What a Morning was published. In 1965, Anderson retired from being a professional singer. She was the first person to be awarded the Eleanor Roosevelt Human Rights Award of the City of New York. She received multiple awards in the span of her career. Some of which are: Spingarn Medal (1939); the United Nations Peace Prize (1977); Congressional Gold Medal (1977); National Medal of Arts (1986); and a Grammy Award for Lifetime Achievement (1991). In 1973, she was inducted into the National Women’s Hall of Fame. She received honorary doctorates from Smith College, Howard University, and Temple University. Anderson died of congestive heart failure in Portland, Oregon on April 8, 1993. 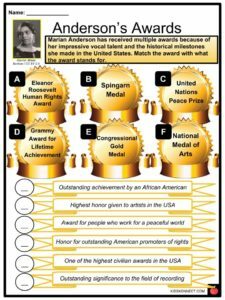 In 1943, the Marian Anderson Award was established and awarded to an exemplary artist who has done outstanding humanitarian work. The Marian Anderson House is in the list of the National Register of Historic Places. The documentary film Marian Anderson: the Lincoln Memorial Concert was added to the U.S. National Film Registry. 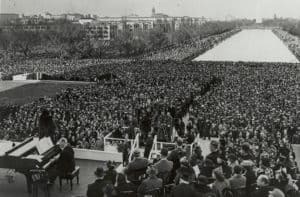 Marian Anderson performed in front of the Lincoln Memorial on April 9, 1939. 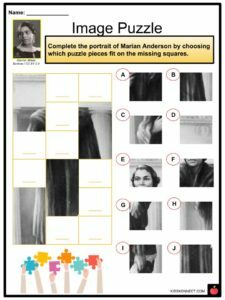 This is a fantastic bundle which includes everything you need to know about Marian Anderson across 22 in-depth pages. 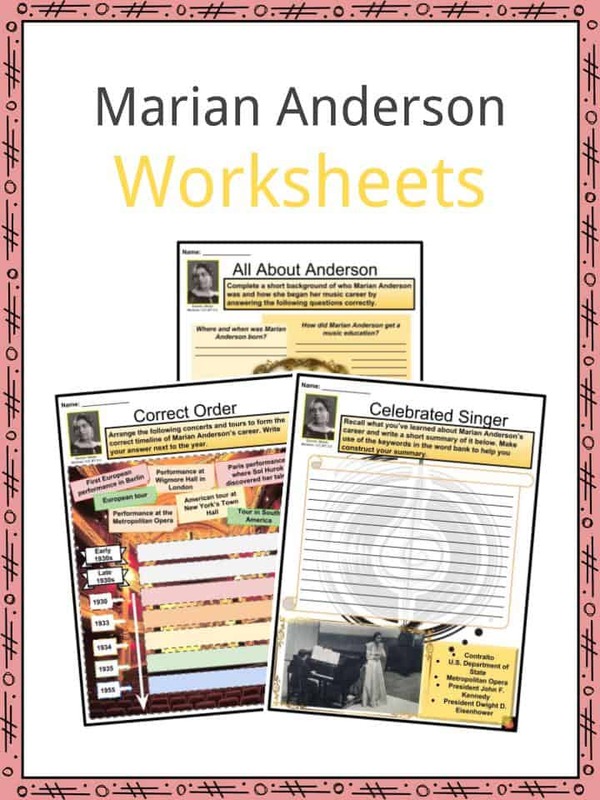 These are ready-to-use Marian Anderson worksheets that are perfect for teaching students about Marian Anderson who was the most highly celebrated African American opera singer of her time. She performed in grand venues with well-known orchestras in the United States and Europe.